It is said that Pepita Texidor Torres "with the raising of her monument, went on to become a symbol of the new Catalan woman and her task that culminated in "Noucentism". - in the papers was written: "...it is not only to the memory, so sweet and so lasting, of the delicate artist that the monument has been raised: it is to the talent and the work of the Catalan woman, synthesised in the dear and so admired Pepita Texidor." Rosa Segarra Martí: "They made the homage into a platform to spread their feminist ideas further from its usual environment. 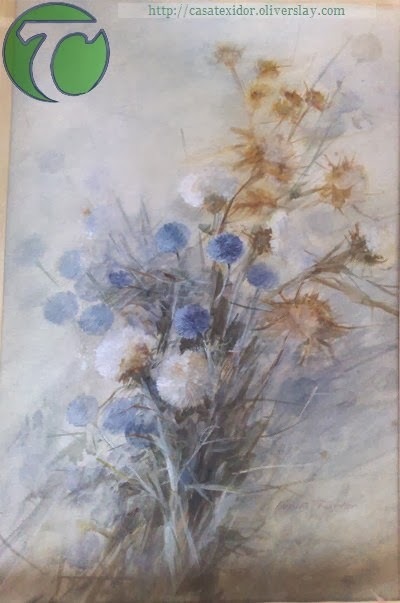 And, in short, this made a network of solidarity among women with a common goal: self-recognition and self-significance through the medium of another woman, Pepita Texidor, painter of flowers." Attached is a painting by Pepita which I acquired from an auction in Barcelona. It was stored by my uncle in Barcelona for about a year and then my third cousin, Emilio kindly drove with it to meet me in France. On my return to the Peak District I found that my neighbour was a professional framer, and so I commissioned him to re-frame it. It is as good as new now and hangs proud in my living room. For a little more background on Pepita see my translation of Nuria Rius' "The Woman: 'Subject' and 'Object' of the Work of Art. There will be a Tribute to Pepita Texidor by Mª Isabel Gascón at the University of Barcelona on the 6th March 2014 at 19:00.
International Day of the Woman: Tribute to Pepita Texidor. In collaboration with the University of Barcelona. Vice President of Institutional Relations and Culture. Conference: Pepita Texidor i el seu món - Pepita Texidor and her world. To mark the centenary of the death of Josefa Texidor we will hold a tribute to her and restore/recover her memory. Women artists had traditionally been silenced, nullified or discredited by their male colleagues, especially if they engaged in something as feminine as the painting of flowers. Pepita, painter of flowers, managed to obtain recognition for her work, although the passage of time has relegated her work to oblivion. Amb motiu del centenari de la defunció de Josefa Teixidor volem rendir-li un homenatge i recuperar la seva memòria. Les dones artistes tradicionalment han estat silenciades, anul·lades o desprestigiades pels seus col·legues masculins, especialment si es dedicaven a alguna cosa tan femenina com la pintura de flors. Pepita, pintora de flors, va aconseguir obtenir el reconeixement al seu treball, encara que el pas del temps l'hagi relegat a l'oblit. All research is carried out at my own expense. I am not paid by any University or other institution.